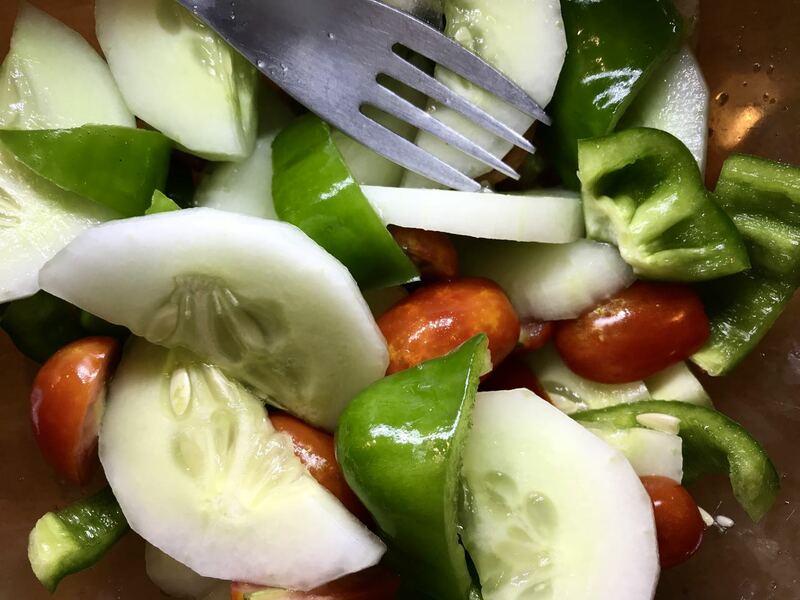 Straight out of the garden, this mix of bell peppers, cucumbers, and grape tomatoes is once of my favorite things about summer. That is a sentence. I am a writer of many things: this site, my teaching site, our travel site, and so on, and have been since I was about 15. As much as I like creating content for the my web site, I often prefer, and get more from, putting pen to paper. With this in mind, I was thinking recently about a couple of friends of mine. One has talked for years about writing a book, but hasn’t, as of this day, started on it. The other writes all the time, and I read every word. These two people aren’t all that different intellectually or artistically, but one of them writes, and one of them doesn’t. My idea for the one who doesn’t, or anyone who wants to build a cadre of written expression, is this: write a sentence every day. Just one sentence, Richard? Yes. If non-writing guy had written a sentence every day since the day he expressed a desire to write this book (January 1985) he would have written roughly 12,000 sentences. As it happens, that is quite close to an estimate for a mid-length book I found, as I wrote this, on Quora. It takes a huge amount of effort, time, and devotion to sit down for ten days and come up with your novel, but it only takes a minute to write a sentence. A minute every day. Write it. There are a lot of “every day” projects out there, some more valuable than others. I remember several years ago everyone was churning out a photo every day with far out-of-focus backgrounds, the so-called “Bokeh 365 Project.” It got old fast, and I don’t know anyone who bothered to get through an entire year. There was also my friend David’s brilliant Poem Every Day project, when he wrote 100 poems in 100 days, for which I generated 100 images. And face this fact: some day it will be 33 years from now. Will you have your novel? 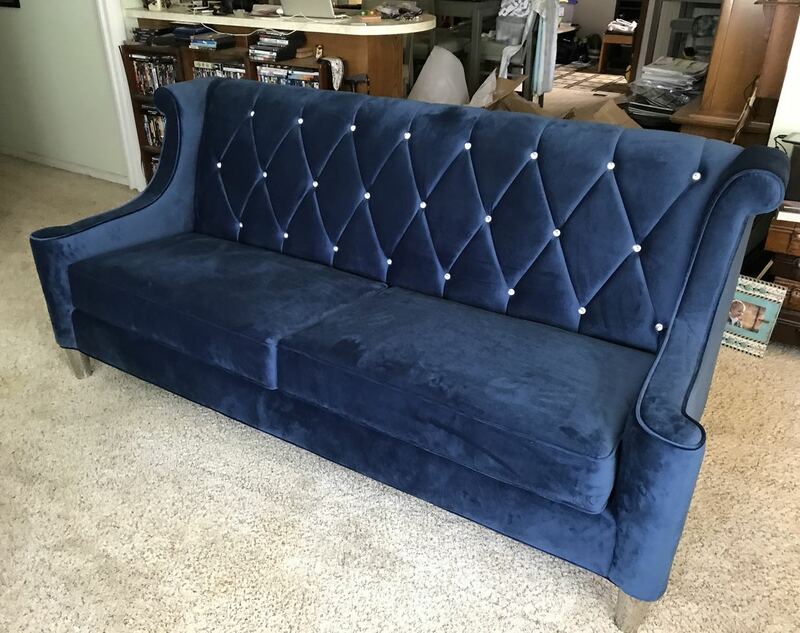 My wife’s new couch arrived today. There, see? Maybe tomorrow I will share a funny sentence about how Summer the Chihuahua loves the new couch. It’s true that Abby’s new couch arrived today. It’s bluer than she expected, but we both agree that it is magnificent. For my part, I actually catch myself thinking that I don’t write enough. Somehow, this worry ties in with what I wrote the other day (ha) about quantity over quality. But that’s all probably too fine a point. I admire your writing greatly and find that you cover a large number of points, succinctly, thoroughly, from a personal and intellectual level, anecdotally, factually, and always from the heart. You are most definitely a blogger, because you blog, damn it. I’ll keep the Sentence A Day project in mind; it’s inspiring. This is tangentially tied to the whole “you’re a blogger because you blog, damn it.” There is a scene in “The Social Network” (great movie, I recommend) where Mark Zuckerberg is accused of having stolen the idea for Facebook. He stares at his accusers and says, “If you had invented Facebook, you would have invented Facebook.” I find myself thinking of this little quip all the time. If you want to write, you write. If you want to take pictures, you take pictures. If you want to be a chef, you cook. Quantity matters if you’re going to do anything and do it well. I wonder if the “I want to write a book” guy actually doesn’t want to write a book. He wants to have written a book. There’s a huge difference. I’d love to have a book on my shelf with some neat cover art and MY NAME on the front cover. “How To Fix Everything”, by Anderson Connors. But I do NOT want to take the time to put the words to paper. I don’t want to do the research. I don’t want to write emails back and forth with an editor at a publishing company, or an agent. I don’t want to proofread. And I certainly don’t want to go on a booksigning tour where I might have to shake hands with strangers — where have their hands BEEN? Someone like you, or Wil, could probably write a book worth reading — without even thinking about it — because you actually enjoy the process. Writing for me is more of a compulsion than a passion. Even when I don’t enjoy it, I feel compelled to type, to compose, to edit, and even to revisit old writings of mine looking for inspiration — or mistakes to correct. I’m sure there is some psychological cause for this, but I have no idea what it is.